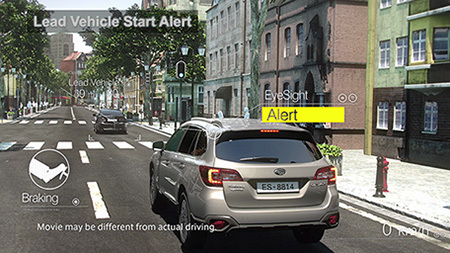 Subaru is committed to driver safety, and that was the key objective behind the development of EyeSight, as avoiding a collision is the best way to remain safe on the road. Subaru's EyeSight has been enhanced further, and the two stereo cameras now capture three-dimensional color images with exceptional clarity to accurately detect vehicles, motorcycles, bicycles, pedestrians and even lane markers on the road. 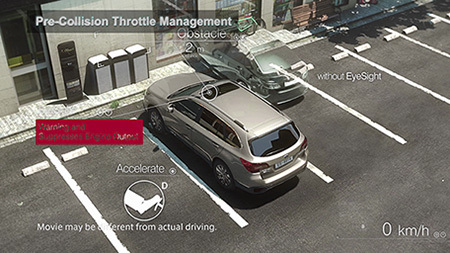 Fine-tuned for faster collision avoidance, pre-collision steering assist and even better adaptive cruise control, the EyeSight system assists the driver with audible warnings and braking control, which helps to reduce driving fatigue and increase peace of mind on the road. 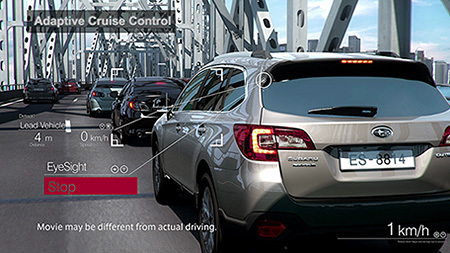 EyeSight has transformed the concept of traditional cruise control. The stereo cameras operate in concert with the engine, transmission and braking systems to ensure that the vehicle remains a set distance behind the vehicle in front, making adjustments for distance. The system is also extremely convenient on long drives or peak hour traffic even in stop-and-go movement. 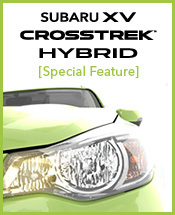 *1 Adaptive Cruise Control is a driving support system designed for to make driving on highways or expressways. The above feature may not operate as expected depending on various conditions including the road, weather, and vehicle. This system does not provide the driver with an automatic driving function that is capable of handling all traffic conditions. Drivers must remember not to exceed posted speed limits. The adaptive cruise control range differs depending on the country. Driving fatigue can lead to a driver unintendedly swaying around their lane. When the system detects that and the vehicle’s speed is approximately 60 km/h or more, EyeSight provides the driver with an audible warning and indicator light to help stay on track. The driver also will be alerted if the system detects that the vehicle does begin to stray into the next lane when driving at a certain speed. EyeSight helps drivers keep up with the flow of traffic by emitting and a sound and a flashing light if the vehicle remains stationary when it detects that the vehicle in front has taken off and traffic has started moving and other conditions are met. EyeSight is designed to assist the driver in slowing the vehicle down or, where possible, bringing it to a stop if it detects a vehicle, pedestrian or object in front. 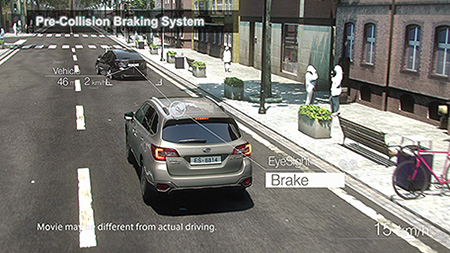 The new system has pre-collision braking and pre-collision braking assist capabilities with a greater range of recognition for objects than previous versions system installed in Subaru vehicles. If the system detects that the driver has failed to take evasive action, it can apply the brakes automatically. When the Pre-collision Braking System is activated, if the system detects that driver's braking input is simply insufficient, the system can increase the braking force automatically. These functions operate when the speed difference from a leading car or object is less than 50 km/h, or 35 km/h (*2) for a pedestrian. Pre-Collision Steering Assist can also be activated if the system detects that there is the possibility of colliding with a vehicle or object in front and the driver operates the steering wheel to take evasive action, by altering the VDC characteristics to help the driver avoid the collision. If the driver mistakenly selects drive instead of reverse when the vehicle is stopped or traveling very slowly, and EyeSight detects an object in front of the vehicle, Pre-collision Throttle Management emits warnings, flashes the lamp and restricts engine output. This may help the driver avoid a nasty mishap at the front. *3 The system may not be activated depending on the shape or visibility of walls or objects in front of the vehicle. - Never drive the car relying solely on EyeSight alone. 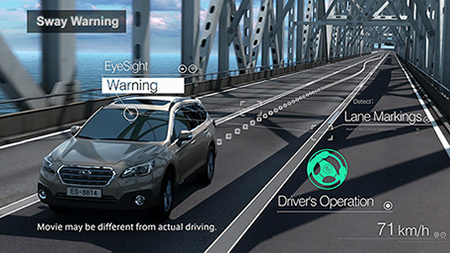 EyeSight has been designed assist the driver in making decisions on the road, and to reduce the chance of accidents or damage due to accidents and driver stress. It was not designed to prevent drivers from failing to focus on the road ahead by driving inattentively or carelessly, nor was it designed to provide driving assistance under poor weather or visibility conditions. It was also not designed to prevent collisions from occurring under any conditions. Drivers are responsible for driving safely and shall comply with all traffic rules and regulations regardless of the fact that the vehicle is equipped with EyeSight. Drivers shall ensure that they are driving safely, and maintain a safe distance between the car in front, pay attention to their surroundings and driving conditions, and apply the brake pedal when necessary or take other measures to maintain a safe driving distance. When a warning is activated, drivers should pay attention to what is in front of the vehicle and the surroundings, operate the brake pedal and take other action as necessary.